China: the new land of “scientific” opportunities? From the16th to the 20th April 2018, Norway's Science and Higher Education Minister Iselin Nybø led probably the largest ever official Norwegian delegation to China, with a focus on Science and Education. 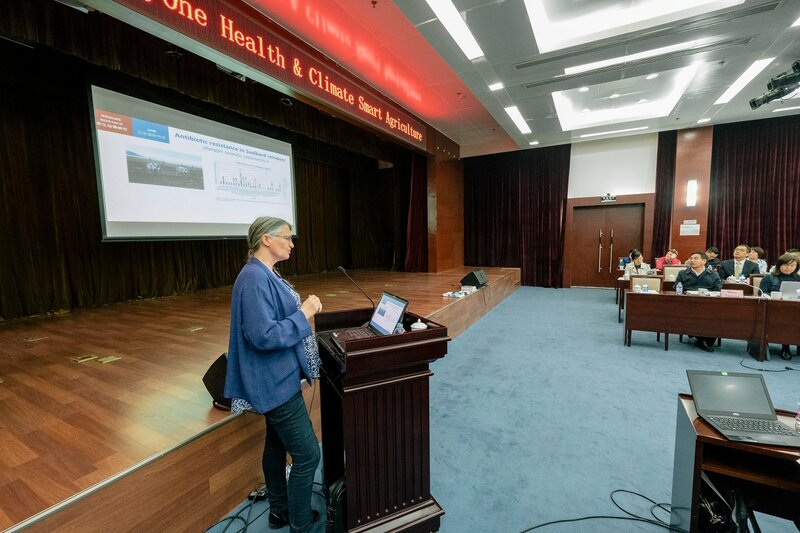 More than 200 researchers, rectors of Norwegian universities and Institute directors participated in this five-day tour to Beijing and Shanghai. The Norwegian Veterinary Institute (NVI) was part of this visit, and before summarizing the visit, it is perhaps important to quickly recapitulate…. Why China? Why now? 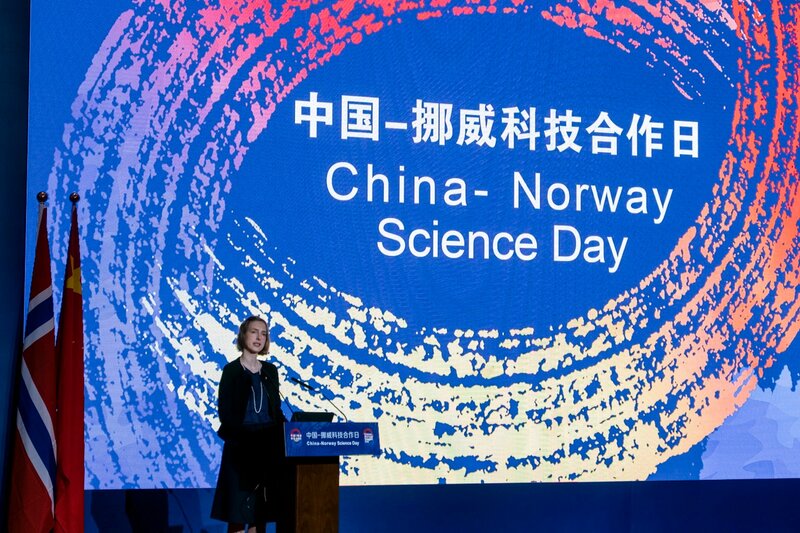 Norwegian Minister Iselin Nybø at the opening of the China-Norway Science Day. Photo: Ragnar Pedersen, NIBIO. Director General Gaute Lenvik at the One Health seminar. Photo: Ragnar Pedersen, NIBIO. Head of Department Merete Hofshagen at the One Health seminar. Photo: Ragnar Pedersen, NIBIO. Director General Gaute Lenvik, the Vice-President of CAAS and the Director General for International Relations of CAAS. Photo: Carlos das Neves. Aquaculture Seminar in Shanghai - Presentation from the Ocean University of China. Photo: Carlos das Neves. By: Carlos das Neves, Head of Section for Food Safety and Emerging Health Threats. Since 2010, China’s total number of scientific publications has ranked second in the world for six consecutive years, second only to the US. Moreover, China’s status as the second largest country contributor to the Nature Index, demonstrated its strength in high-quality primary research. The number of domestic resident invention patent applications rose to 1 million in 2015, indicating that China continues to top patent application list globally. In 2016, China took the lead from the US on total number of publications within Science & Engineering, showing again its strong competition potential for other fields in the near future. The research and development (R&D) intensity - the R&D expenditure as a percentage of gross domestic product (GDP), which now stands at 2.1%, compared to Norway’s 1.93% in 2015 - continues to grow at a quicker pace than most other developing countries. China also ranks first for science and technology workforce in the world since 2014. Finally, as the world’s second largest economy China is also a key player on the major challenges and threats that our planet faces. Climate change, food security, CO2 emissions, use of antibiotics, overpopulation and poverty are just a few examples of issues that cannot be solved without the active contribution of China. Recognising this, the country has been a key supporter of the United Nations Sustainable Goals programme, and national strategies in China have highlighted the importance of sustainable development and protection of the environment. After several complicated and tense years, Norway and China normalised their relations in 2016, opening a new chapter for co-operation and increased mutual investment. Several high-ranking political visits in the last two years (including one in 2017 by Norway’s Prime Minister) have helped solidify this mutual commitment. Due to these tense years, China moved quicker with other European countries in science co-operation and it is now important for Norway and China to make up for lost time. 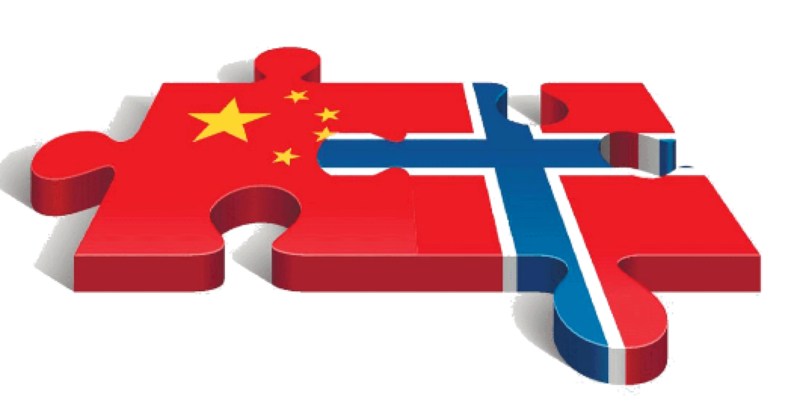 The Norwegian Government has prioritised China in its recent PANORAMA strategy for international co-operation, and the Norwegian Research Council has now updated its strategy for collaboration with China. Priority topics for scientific collaboration include food safety, sustainable use of marine resources/aquaculture, sustainable agriculture (including animal production), climate/environment and polar areas. All these areas are relevant to the NVI and this was also a main driver behind our participation in last week’s visit. Another reason for the NVI to prioritise China is the recent signing of a memorandum of understanding (MoU) between our sister institution, the Norwegian Institute of Bioeconomy Research (NIBIO), and the Chinese Academy of Agricultural Sciences, where the NVI is mentioned as a strategic partner for NIBIO in the scientific areas that traditionally fall within the NVI’s competence. This was further highlighted in the Government budget orientations for the NVI in 2018, where the Institute is requested to invest in its scientific and strategic collaboration with China, the only country named specifically in those ministerial guidelines. Strategy for collaboration with China. The visit was divided into two main topics: science and education. 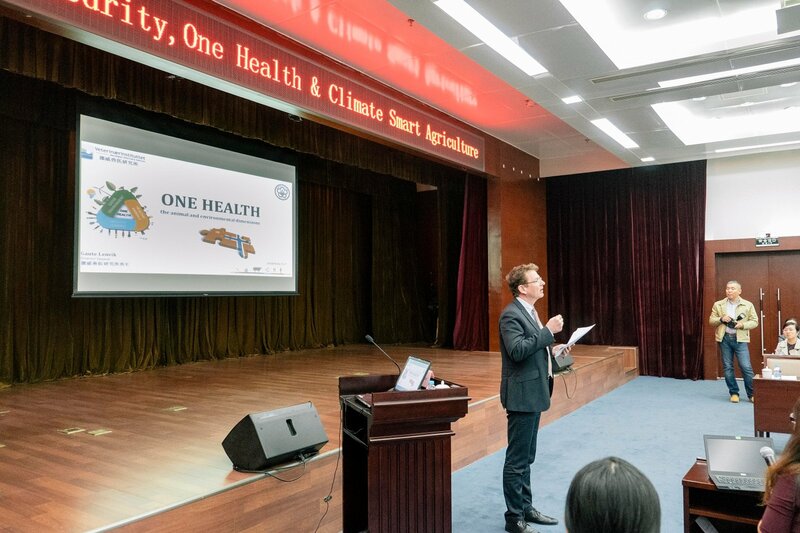 We started in Beijing with a full day dedicated to science, where Norwegian and Chinese partners held several parallel seminars on topics ranging from engineering to renewable energies, from clean smart cities to One Health! The NVI, in close collaboration with The Norwegian Institute of Public Health (NIPH), The Norwegian University of Life Sciences (NMBU) and NIBIO from Norway plus the Chinese Academy of Agricultural Sciences organised one of these seminars entitled: “Food security, One Health & Climate smart agriculture”. With an audience of more than 50 people, I would say it was a huge success, and our Chinese colleagues were extremely happy with the topics addressed and the chance to talk about these with us. For NVI, Gaute Lenvik introduced our institute and how ONE HEALTH is a strategic axis of our work, while Merete Hofshagen presented a few examples of ONE HEALTH emerging threats that are common to Norway and China and where co-operation may help both countries to better tackle these challenges. NIPH also covered ONE HEALTH from the human perspective and both NIBIO and NMBU focused on sustainable agricultural development and food production. We heard the Chinese Centre for Disease Control and Prevention talk about emerging threats such as Avian Influenza, and the Harbin Veterinary Institute talk about their preparedness for dangerous animal disease outbreaks. 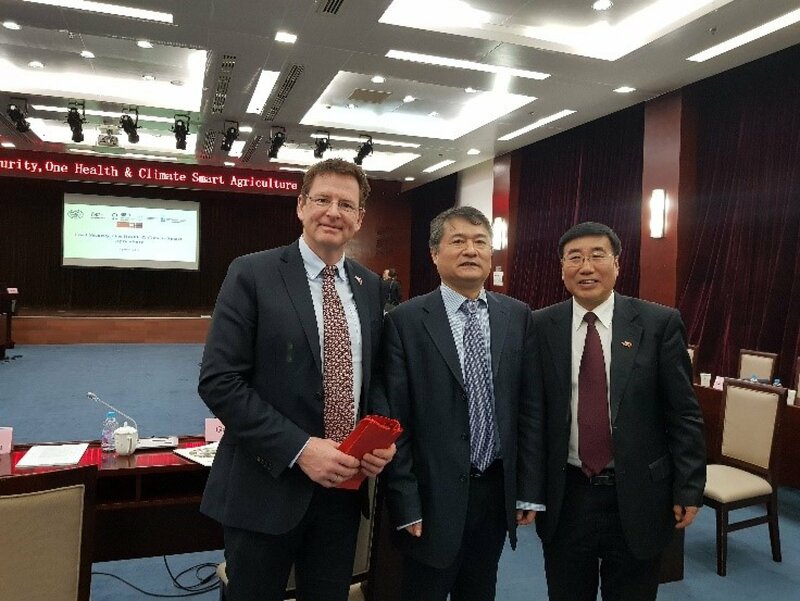 Parallel to this seminar, the NVI held a meeting with the Harbin Veterinary Institute (the largest veterinary institute in China) to discuss future collaborations, and Gaute Lenvik formalised an official invitation to the Harbin Veterinary Institute leadership to visit Norway this year. Gaute and Merete returned to Norway after this seminar while I remained with the delegation and continued to Shanghai to represent the NVI there. After this first one and a half days devoted to science, the programme continued towards education with several seminars highlighting development of joint curricula, exchange of students and professors, and mechanisms for increased financial support to educational joint programmes. 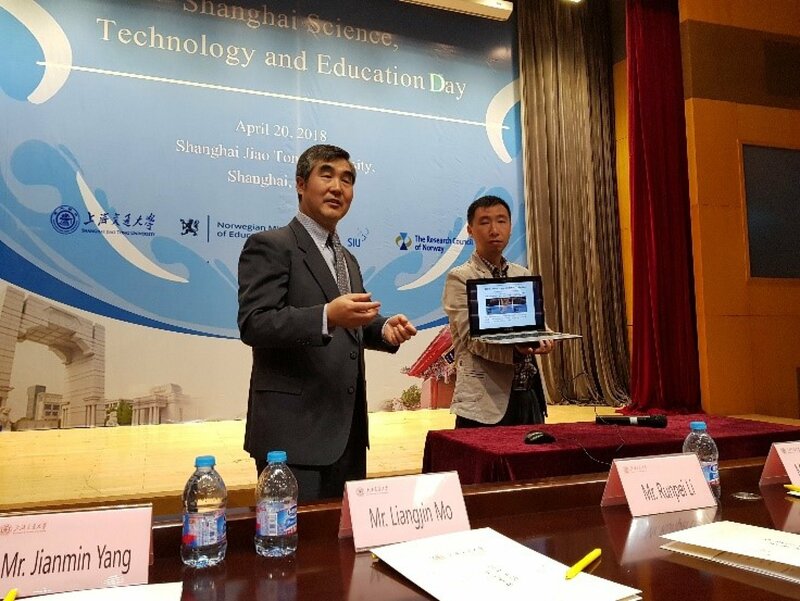 In Shanghai, science returned to the main table and we focused on the oceans and on polar research through several seminars. The NVI took part in the “More Food from the Ocean from Sustainable Aquaculture” seminar, where I on behalf of Atle Lillehaug delivered a short presentation on fish health, and on how health must be a key part of any plan aiming at sustainable development of aquaculture in China or anywhere else. There was a strong engagement from Chinese partners, who were very interested on how to tackle emerging diseases in aquaculture. The Chinese also presented their ongoing pilot project of salmon production in open waters, and confirmed that this may open a door to new health threats that one should better avoid than remediate! Finally, they extended to the NVI an invitation to visit this salmon pilot project. To conclude, the delegation focused on the Polar Regions and a seminar organised by the Norwegian Polar Institute and the Chinese Polar Institute covered many topics related to regulation of Arctic resources, climate challenges as well as human, fauna and global health. Globally, I would say this trip allowed us to have a much broader picture of the Chinese scientific portfolio and allowed us to make new contacts with potential partners for future R&I projects. This visit was also a prime opportunity for Norwegian institutions such as the NVI, NIPH or NIBIO to put their ONE HEALTH commitment to the test. Working as a “ONE HEALTH NORWAY TEAM” we delivered a strong united message that ranged from crop to human health covering animals, fish and food. Of course, many will say that good intentions and nice talks are not enough, and if scientific collaboration is to proceed one needs a strong funding mechanism in place! Here too Norway and China are moving quickly. After the signing of a MoU last year between both countries' Ministries of Science and Higher Education, Norway and China worked quickly to produce their first joint bilateral call for scientific projects. It focused on two main topics: Integrated multi-stressor impacts on ecosystems and Sustainable agriculture (this last one including food security and sustainable agriculture, plant health and plant protection, animal health and sustainable exploitation of plant genetic and other natural resources, food safety and public health, including antimicrobial resistance (AMR) and pesticide residues in food and feed). Here too, I am happy to report that the NVI worked quickly and efficiently and is co-ordinating three project applications and participating in one more. I would like to finish by saying a big thank you to these project leaders and a few others at the NVI who have worked around the clock in these last two weeks to ensure that their projects were successfully submitted. It was not easy, partly because of the language barrier, but the projects are in and we hope that all of them once financed (why not be optimistic?) may be the first steps in the co-operation between the NVI and the “science giant” that is China.